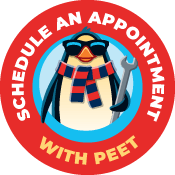 The best gift you can give your heating and cooling system is the gift of annual maintenance. Annual service keeps our systems running smoothly all year round and preserves its longevity. Plus, you can save a great deal of money each year by investing in an HVAC service plan for your system. A decent service plan doesn’t just prevent breakdowns and offer tune-ups, it also provides additional benefits such as coupons, discounts and priority service. Own your own business? It doesn’t matter if it’s large or small. We offer service plans for commercial customers that cover a wide range of inspections and checks. All plans include a 15-point heating and cooling inspection. This process entails our expert techs assessing your system, examining all the components in detail and evaluating the mechanical integrity of the system. Waddle on over to our blog each month and stock up on HVAC tips and news!